There are basically 2 types of jaw bone cancer; The first type is the tumor that actually starts within the jawbone. This means that cells inside the jawbone start to become a tumor. These are quite rare. The other type of jaw bone cancer is where the tumor starts off SOMEWHERE ELSE in the body, and cells from that primary tumor break off and travel into the jawbone. The most common example of this is a squamous cell carcinoma that starts in the mouth. In other words, you get a cancer tumor starting in the soft tissues of the mouth, and some of the tumor cells travel into the jawbone, and start a new tumour there. The shocking image below shows a jaw bone tumor that started off as a small tumor in the soft tissues at the back of the mouth. After 2 years of ignoring the problem, cells from the soft tissue tumor in the mouth had spread to the jaw bone, producing this massive lesion. 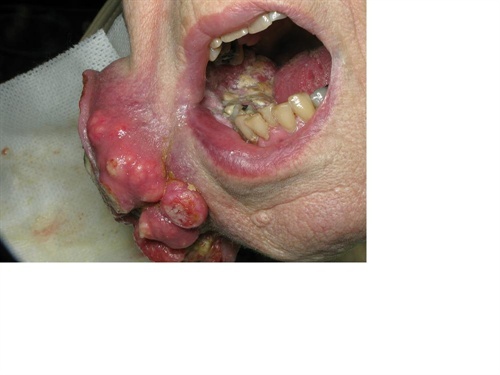 cancer that has spread from the mouth to the jaw bone. The main symptoms of jaw bone cancer are the result of pressure within the jaw caused by the tumor growing. As the tumor gets bigger, it presses on teeth, nerves, blood vessels and the walls of the jawbone itself. Pain. Pain in the jaw is unusual in the early stages, but is a typical symptom of later stage jaw cancer. The pain gets gradually worse as the tumor grows. It is usually a constant, dull pain. The pain may spread to the neck or the face if the tumor is pressing on a nerve. Depending on the location of the tumor within the jaw, chewing may be painful. The area affected by the tumor feels tender to the touch. Swelling. Jaw cancer tumors of any significant size will eventually cause a swelling on the face or inside the mouth. Tumors that grow on the inner side of the jawbone can cause a swelling inside the mouth. Those growing on the outside of the jawbone typically cause a swelling of the face. Loose Teeth. Teeth getting loose over a short time period can be an early sign of jaw bone cancer. This is caused by the tumor affecting the bone around the tooth sockets, softening and then absorbing the bone, causing loosening of the teeth. For example, if you have had kidney cancer in the past, it is possible for some cancer cells to travel to the jawbone, and start up a new tumor there. This new tumour breaks down the bone and can cause a tooth to become loose. It's called a secondary renal cell carcinoma. An extra problem here is that this secondary tumour is full of blood vessels. If your dentist tries to take out this loose tooth, it will probably bleed a lot right afterwards. Once you have reported a swelling and pain to your dentist, he will take X-rays of the affected area. These will show the size of the tumor, but not the full extent. You will need a 3-D CT scan for that, usually in a hospital or clinic. Also, a biopsy will be necessary to determine whether a tumor is benign or malignant. This involves removing a small piece of the affected area, under anesthetic, so that the tissues can be examined in a pathology laboratory. Then it's possible to see what type of cells are involved and how advanced the jaw bone cancer may be. Occasionally, a benign tumor or cyst can be left untreated. They will need to be monitored over time by your doctor. Even a benign cyst or tumor can weaken the surrounding bone and tissue if they continue to grow. Jaw bone tumors generally need to be surgically removed. Depending on the type of tumour, an area of bone around the tumour may need to be taken away as well. Some surgical reconstruction of the area may necessary. This is where a team of specialists will work together, such as a maxillo-facial surgeon, a plastic surgeon, and a dentist specialized in restorative dentistry. (Prosthodontist). The area around the tumor will be monitored to make sure that it doesn't start up again. Radiotherapy and chemotherapy may also be used in combination with surgery, sometimes before surgery to shrink the size of the tumour, and sometimes after surgery to kill any cancer cells left behind. 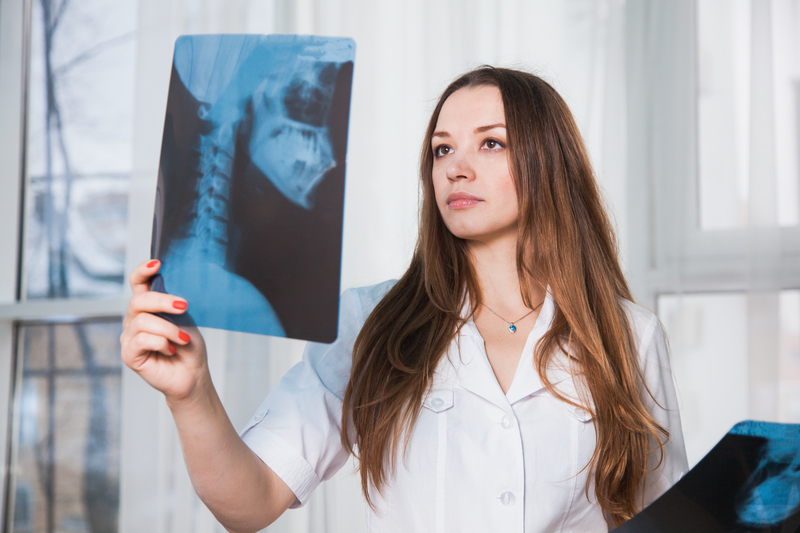 What Causes A Jaw Bone Tumor? Nobody knows for sure. There are 3 types of BONE cancer, which include jaw bone cancer. The first one is known to begin in the cells of the bone, and is common in children and young adults. It is called osteosarcoma. The second one is called a chondrosarcoma, and it affects older adults. The third one is known as Ewing's sarcoma, and is common in children and young adults. By far the most common in other bones is osteosarcoma, but it is rare as a primary tumour in the jaws. When it does occur there, it seems to be much slower and less aggressive than when it occurs elsewhere in the body - which is good news! Like all tumours everywhere in the body, jaw bone cancer has the best chance of successful treatment if it is picked up early. So if you think you have a swelling coming up anywhere, even if it doesn't hurt, get it checked and X-rayed as soon as possible. It could save your life!